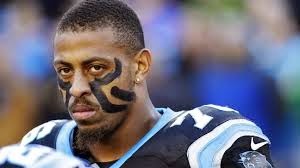 The Appeals trial of Greg Hardy; football player for the Carolina Panthers; was terminated in a dismissal Monday when his accuser; the elusive Nicole Holder; did not appear. Nothing sinister going on; she has been sighted skiing and partying elsewhere in the country in recent days; leaving many with the impression that she’s spending the money which Hardy provided her with to not appear at the trial. Indeed the media have confirmed that a deal for an undisclosed sum has taken place. It seems odd that the Prosecutor’s office in Mecklenburg County; which is where the offense and original trial took place; sees nothing wrong with this. On the surface many will agree. But examine this a bit more closely and see if it passes the smell test, or if it smacks of a double standard. First you have to forget the victim in this case; as she has seemingly done herself. That leaves Justice as the defendant; an ironic twist considering that the victim was the original Plaintiff. Her actions; or should I say inactions, along with the acquiescence of the Mecklenburg County Prosecutor’s office; have turned justice on its head by allowing Ms. Holder to walk away from the Appeals portion of the trial she initiated. That’s right; the victim here has now become the person obstructing justice in her own case; in which she alleged she was beaten and threatened with physical violence at the hands of Greg Hardy. She has; of her own volition, and for profit; sold her status as a victim and become the criminal. She has done irreparable damage to the claims of women everywhere who have been legitimately assaulted. As for the Prosecutor’s Office I have but one question; what is the difference between offering someone money to withdraw testimony, and intimidation of a witness? Surely there is an element of intimidation involved in this. If someone is willing to give you $100,000 to go away quietly, then I must assume they would pay $50,000 for you to disappear if you refused the offer. And the recipient of that $100,000 knows this is true to a certain degree. And that constitutes intimidation, even if she accepts the money which should never have been offered. When someone files charges with the Court there is a perceived bond between the two. The victim has asked for the court’s help in resolving a problem which is beyond the Plaintiff’s ability to solve on their own. When that person then walks away from the Court; in this case by not showing up for the trial; they sever that bond and the expectation of protection that it offered. And when money changes hands that victim becomes a criminal. But the real victims in this travesty of our Justice system are the thousands of people who will not be taken seriously when they file domestic abuse claims. Then there are the rest of us; we have all been robbed collectively of our faith in the Justice system to go beyond the money and deliver real justice. The Prosecutor has said that this is just a misdemeanor case and not worth pursuing; but it seemed to be worth a lot more to Greg Hardy; underscoring just how wrong the Prosecutor is, as well as undermining the credibility of Ms. Holder’s original charges in the first place. As I said, the real losers here are you and I. Note: The Prosecutor’s Office was unable to answer my questions concerning why they did not seek a subpoena for Ms. Holder to appear; citing only that the judge would have had to sign off on one if it were issued. In this case it appears that the Prosecutor’s office did not consider it to be worthwhile according to District Attorney Andrew Murray. Mr. Murray’s office has not been able to locate Ms. Holder since November, in spite of her numerous appearances on social media. If this assertion is true; that the DA’s office has not been able to locate their star witness since November; in spite of what Mr. Murray describes as “extraordinary efforts”; then it smacks of gross indifference of the well-being of Ms. Holder by the DA’s office.That in itself will serve as a deterrent for other victims to come forward. You can contact the District Attorney’s office directly at 704-686-0700. Tell them Rooftop sent you.